September has been a good month for Mindy Kaling. Just hot off the release of her second memoir, Why Not Me?, Kaling’s TV show The Mindy Project—which was recently saved by Hulu from Fox cancellation death—premiered its fourth season this week. As someone who has, for better and for worse, faithfully followed Mindy Lahiri’s romantic antics for the past three years, the show not getting picked up somewhere else never really registered as an option. 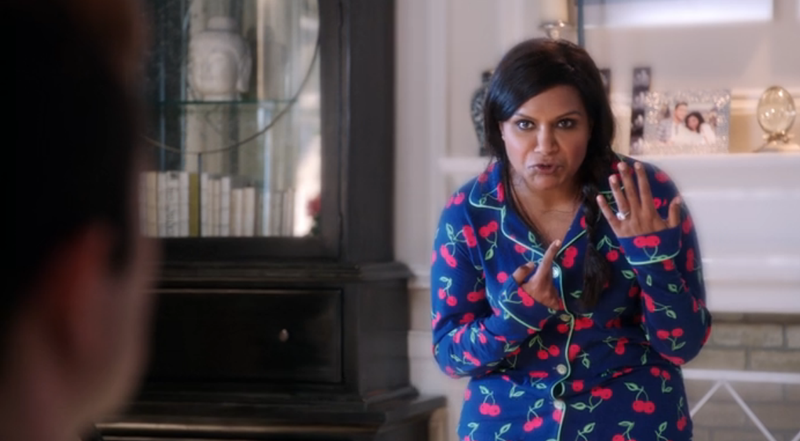 Season three ends with “Will Mindy’s Baby-Daddy Give Up His Cynicism About Marriage And Propose Already?” and that’s just not a cliffhanger any self-respecting rom-com (and Mindy Project is the most self-respecting) leaves hanging. Season four might mark a shift in networks, but it begins exactly where the show left us: with said baby-daddy and Mindy’s longtime boyfriend Danny Castellano (Chris Messina) knocking on the door of her parents’ apartment in Mumbai. Talk about seamless seriality: Hulu’s season four literally begins with a new door opening. By placing this door (and, really, most of the episode) in a different country, not to mention continent, it also feels like a thought experiment for “What if we had done this show totally differently?” It’s a smart move in the context of network transitioning. To recap: Danny has gone to confront Mindy’s parents in India without informing Mindy, so that when she returns to their shared home, she finds it inexplicably empty. Over the phone, Morgan Tookers (Ike Barinholtz) offers some worst-case scenario reassurance: “What’s the worst that can happen? Dr. C met another woman and fell in love with her and he’s with her now.” This conjecture triggers the way the rest of the episode proceeds. “My life would be so much better if I’d just fallen in love with someone else,” Mindy says to herself, right before falling asleep that night. Meaaaanwhile, Danny is in India, trying to negotiate how to tell Mindy’s parents that he loves their daughter, but just doesn’t believe in marriage. When Mindy wakes up, she’s in an alternate universe in which she’s married to and living with Matt Sherman (Joseph Gordon-Levitt), a producer of The Real Housewives franchise, in a house that looks like “a soap opera set.” In other words, it’s everything the Mindy Lahiri we’ve grown to know and love over the past three seasons would want. It’s so perfectly rom-com (JGL!!) with a set that is so beautifully curated that—if we understand The Mindy Project to be the televisual reenactment of the classic Hollywood rom-com—we might wonder why the show hadn’t just taken this narrative path in the first place. But, of course, everything is wrong with this world: Mindy loves Danny, even in this new articulation of a nightmare in which Danny despises Mindy and is dating Freida Pinto. While trying to convince Danny that they’re meant to be, Mindy recalls to him a crucial moment (circa Season 2) in which Danny runs to the back of an airplane, where Mindy is exploring snacks, and kisses her. In this iteration of her life, however, Danny never kisses her—which then allows Joseph Gordon-Levitt to walk out of the airplane bathroom door, see Mindy alone, and step into her life. But there is some realness to all of this. While TV is certainly not as contingent as real life, it’s also not as rigidly fated as film. If Danny didn’t kiss Mindy on that airplane, then somebody else did. And, it seems like, if Mindy hadn’t woken up also carrying all the memories of her past few years with Danny, then this version of her life would have been more than okay. The Sliding Doors narrative trick—especially when imported to television—is a reminder that Danny and Mindy aren’t, in any essential way, “meant to be.” They’re meant to be because we’ve invested years of watching them bickeringly fall in love. Maybe Mindy’s life would be better if she’d just fallen in love with someone else. But she didn’t. When Mindy finally wakes up in a panic, there’s Danny at the foot of her bed, reassuring her that it was all a bad dream. Then he asks, “Mindy Lahiri, will you marry me?” It’s not a huge surprise, but did it ever take a lot of work for us to get here. What’s more surprising is the way the “it was all a dream” plot device results in a proposal; the letdown that usually follows hasn’t happened yet. (The Mindy Project: subverting old genre clichés since 2012.) Proposals, too, usually cut right immediately to some happily-ever-after, but this season of the show (its last, as far as we know) contains 26 more episodes. That happily-ever-after has a long while to play out. Why Not Me? is, verbatim, the title of Kaling’s memoir. It’s a great title for a memoir, since it doesn’t suggest whether the “me” should be experiencing potential joy or love or, in Diski’s current case, a lot of pain. Having recently gotten dumped, I’ve been on Tinder a lot these days. It’s generally grim, but swiping through profiles also offers a flickering montage of potential future storylines. Why not you? Why not you? It’s just the start of the story. Jane Hu is a writer and grad student living in Berkeley.